There are two main reasons serious movie lovers often choose a preamp/processor like the Integra DHC-60.7 to control their home theaters: versatility, and superior audio performance. The DHC-60.7 combines high-end audio and video processing with cutting-edge entertainment features, to deliver an immersive home theater experience. And you can connect it to the amplifier(s) of your choice. Dolby Atmos® and DTS:X™ decoding deliver incredibly detailed movie sound. 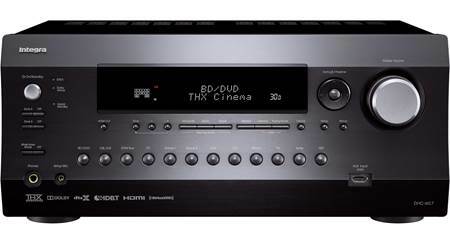 THX® Ultra2™ Plus certification guarantees faithful, distortion-free reproduction of movie soundtracks. 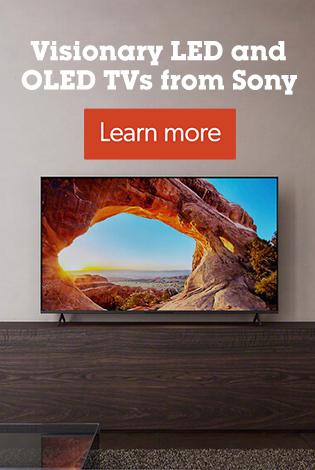 On the video side, you'll enjoy incredibly detailed picture quality with compatible 4K TVs and Ultra HD Blu-ray players. Because the DHC-60.7 delegates the amplification duties to a different component, it separates the noise-inducing high-voltage/high-current circuits in the amplifier from the sensitive low-level circuits in the pre/pro. The DHC-60.7 uses hand-selected parts, including a customized low-noise transformer. The result is lower noise, unfettered dynamics, ultra-precise channel separation, and an overall sense of transparency even with the most challenging soundtracks. The DHC-60.7 has 9-channel preamp outputs — both balanced XLR and unbalanced RCA — and 7 channels of processing, allowing for flexible speaker configurations. With outputs for two powered subwoofers, you can set up a 7.2-channel surround sound system or a 5.2.2-channel Atmos system in your home theater. A second HDMI output lets you watch the same video source in your main zone and a second room. Start a movie in your living room and finish it in your bedroom or kitchen. Or watch the same content on a TV and projector in the same room. 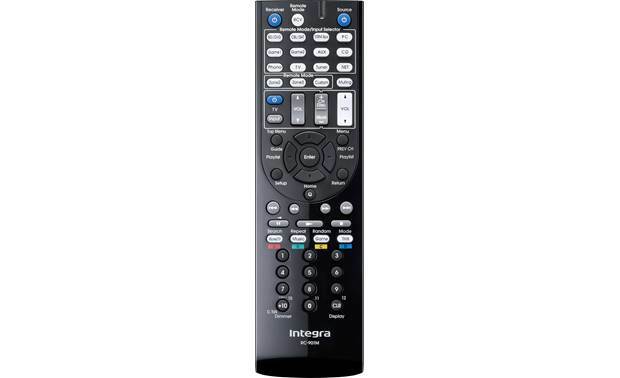 Use the Integra Remote smartphone app to control playback in different zones from anywhere in the house. Configurable 9.2ch Preamp Outputs: The Integra DHC-60.7 AV Controller provides a set of 9.2ch unbalanced RCA pre-outs and a set of 9.ch balanced XLR pre-outs to connect one or more multichannel and/or stereo power amplifiers (the dual sub pre-outs are discrete). You can configure these 9.2ch outputs for up to 7.2ch or 5.2.2ch surround sound processing. You can also configure the preamplifier's XLR pre-outs (not RCA pre-outs) to bi-amp your front speakers with your connected external power amplifier(s); in this case only 5.2ch can be played back in the main room since the unit's "Height/Surround Back" channels are reasigned to bi-amp the front speakers. Balanced XLR connectivity enables high-quality signal transmission with reduced degradation of sound quality due to external noise. 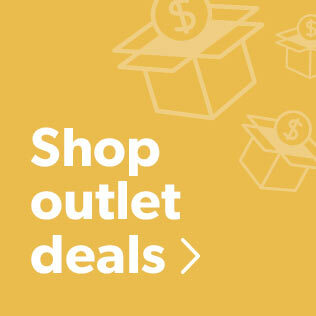 Both the balanced XLR and unbalanced RCA outputs feature gold-plated connections for excellent signal transfer. Note: The DHC-60.7 works as an AV Controller when connected with a multichannel power amplifier (sold separately). Connect your power amplifier or amplifiers to the pre-out RCA jacks or pre-out XLR jacks of the AV controller, and then connect your power amplifier(s) to your loudspeakers. 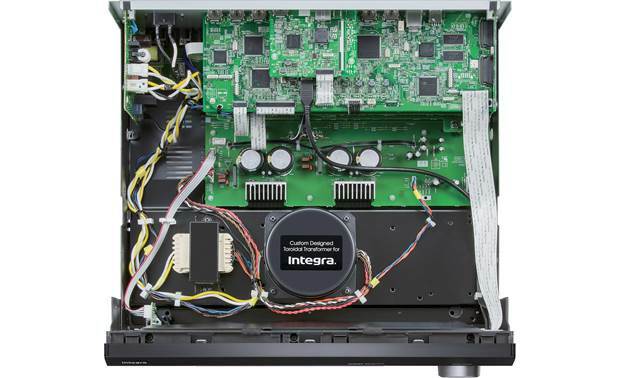 Hand Selected Audio Tuned Parts: Sound quality is the key factor in Integra's design process. The DHC-60.7 utilizes hand-selected parts including a customized low-noise, high-performance transformer and audio tuned custom capacitors. These parts are selected for their audiophile quality and acoustically transparent characteristics. The result is lower noise and more accurate frequency response, outstanding signal tracking and linearity, unsurpassed dynamic range, precise channel separation, and sonic accuracy even under the most challenging circumstances. 32-Bit Architecture: Dual 32-bit DSP Engines and a premium quality 384kHz/32-bit, 8-channel digital-to-analog converter (AKM4458) from AKM ensure effortless high-quality playback and excellent sound quality. Advanced Circuitry: The Integra DHC-60.7 AV Controller incorporates a variety of advanced circuitry to eliminate jitter & distortion for cleaner, clearer sound reproduction. Vector Linear Shaping Circuitry: Vector Linear Shaping Circuitry (VLSC) reassembles the signal in its original form following processing. Unlike conventional filters, VLSC removes pulse noise generated in D/A conversion, allowing the sound wave to be reproduced with extremely high fidelity for a smooth analog signal. The signal's data is converted between sampling points and joined with analog vectors in real time to produce a smooth output wave form. The result is a virtually noiseless, smooth, analog signal that brings out even the most subtle of nuances in music sources. AccuEQ Advance Calibration: The DHC-60.7 incorporates AccuEQ Advance calibration technology and comes with an auto calibration microphone. AccuEQ Advance calibration technology reveals the true potential of your speakers by eliminating standing waves from your listening space using multipoint measurements. These acoustic peaks distort the audio image and prevent your loudspeakers from voicing the sound as their designers intended. AccuEQ Advance also utilizes Partial Band Equalization and only corrects frequency response below a certain point, leaving high-order harmonics untouched - so your speakers are free to reproduce the emotion in the recording faithfully and naturally. In addition, AccuEQ Advance includes three memory presets you can use to save your own customized EQ settings, perhaps tailored to suit different content such as movies, music, or games. Room Measurements: In the second round of AccuEQ Advance measurements, your room's sonic characteristics are evaluated. Using this information, AccuEQ Advance is able to prevent standing waves from forming by adjusting frequency response. AccuEQ Advance is also the only room acoustic solution that listens and compensates for the subtlest background noise (such as the hum of an HVAC) to ensure a higher degree of measurement precision. 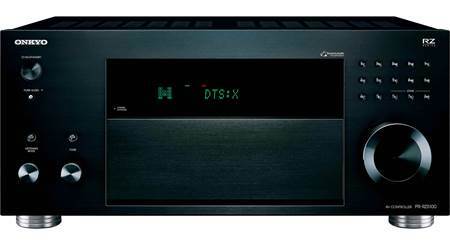 THX Ultra2 Plus: The DHC-60.7 is THX Ultra2 Plus certified. THX certification provides home consumers with an experience "as the director intended" in the cinema. THX spends 40-60 hours testing over 2000 data points ensuring that the DHC-60.7 is capable of meeting rigorous audio and video performance standards for reference level, distortion-free playback. THX's Reference Level matches the exact volume level as used in the mixing room by the sound designer (85dB plus 20dB of headroom), so you hear precisely what the engineer hears. The DHC-60.7 also includes THX's Loudness Plus technology to bring out intricate details at lower listening levels. THX Loudness Plus dynamically rebalance the sound mix when volume is lowered, so you still get the full impact of your entertainment experience regardless of volume setting. In addition, THX incorporates and utilizes other advanced technologies to bring the experience of a movie theater into your home. Listening Modes: THX Ultra2 Plus offers different Listening modes (including Cinema, Music, Game, & Surround EX) suited for a variety of content, so you get the best experience no matter what type of content you are enjoying. Note: THX Ultra2 Plus is recommended for screen-to-seat viewing distances greater than 12 feet and for room volumes of 3000 cubic feet or greater. Compatible Digital Audio Formats: The DHC-60.7 AV Controller supports the following stereo & multichannel digital audio formats through its HDMI jacks and optical/coax digital inputs. Immersive Surround Sound: The Integra DHC-60.7 AV Controller goes beyond regular surround with the latest immersive surround sound formats, including Dolby Atmos, Dolby Surround, DTS:X (firmware update available), & DTS Neural:X (firmware update available). Dolby Atmos: With Dolby Atmos, sound comes alive from all directions, including overhead, to fill your home theater with astonishing clarity, power, detail, and depth. The DHC-60.7 has the processing power to run a more enveloping 5.2.2ch Dolby Atmos layout utilizing ceiling mounted or Dolby Atmos-enabled speakers (sold separately). 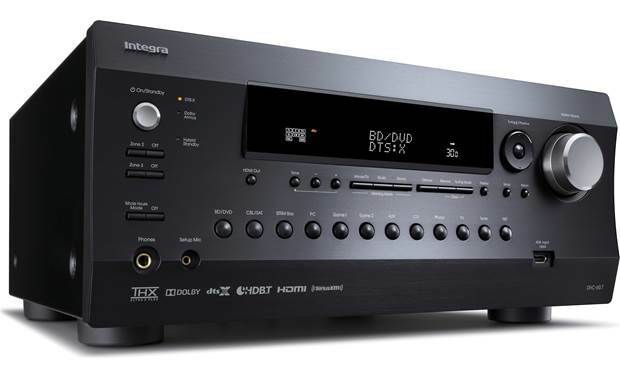 Audio Enhancements: The Integra DHC-60.7 AV Controller provides various audio enhancements to deliver a high-quality listening experience every time. Bass Management: The Integra AV Controller offers Tone Control, Phase Matching Bass technology, and a Double Bass feature to get the most bass impact out of your system. Tone Controls: You can independently adjust the Bass (20Hz) and Treble (20kHz) of all AV Controller's channels from -10 to +10 dB. The AV Controller also provides independent Bass and Treble control for Zone 2. Phase Matching Bass: Integra's Phase-Matching Bass optimizes low frequencies while preserving mid-range clarity. This means that powerful bass plays back with clear vocals; it doesn't overpower them. Volume Setup: The Integra AV Controller provides the following volume settings. Volume Display: You can choose to display the "Relative" volume scale (-81.5 to +18dB) or an "Absolute" volume scale (0 to 82). IntelliVolume: With IntelliVolume, you can set the input level for each input (+/-12dB) selector individually. This is useful if one of your source components is louder or quieter than the others. This function does not work in Zone 2 or Zone 3. Maximum Volume: Use this feature to set the AV Controller's maximum volume level. This feature is useful to avoid turning the volume too loud by mistake. You can set the Max Volume from 50-99 (max), or Off (disabled). Power On Volume: Use this feature to set the volume level when the power is turned on. You can choose between Last (same as the volume when the unit was turned off), Min (0), or 1-99. Balanced & Unbalanced Analog Inputs (including Phono): The Integra DHC-60.7 is outfitted with 8 unbalanced RCA stereo analog inputs (including a Phono MM input), as well as one balanced stereo XLR input. Balanced XLR connectivity enables high-quality signal transmission with reduced degradation of sound quality due to external noise. Both the balanced XLR and unbalanced RCA inputs feature gold-plated connections for excellent signal transfer. Optical/Coaxial Digital Inputs: The Integra AV Controller is equipped with three optical (toslink) digital inputs and two coaxial (RCA) digital inputs. 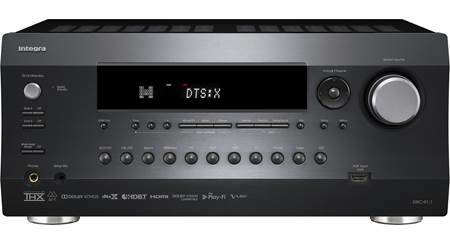 You can choose auto decoding , PCM, or DTS for the digital audio inputs. Auto will decode the signal in its original form (Dolby Digital, DTS, PCM, etc), PCM decodes the signal to 2-channel, while DTS decodes only DTS formatted sources. HDMI 2.0: The Integra DHC-60.7 has eight HDMI 2.0 inputs (7 rear/1 front) and two HDMI 2.0 outputs. Thanks to the latest HDMI 2.0 specification, the AV Controller can support 4K/60 Hz Ultra-HD video, HDCP 2.2 compatibility, High Dynamic Range (HDR), 4:4:4 color sub-sampling, and BT.2020 Wide Color Gamut. HDCP 2.2: The controller's HDMI inputs (1-5) and outputs support HDCP 2.2, which fully complies with the latest copyright protection standard for 4K video transmission. HDR (High Dynamic Range): HDR provides enhanced picture quality by simultaneously enabling greater detail for both the dark and bright parts of an image. HDR reproduces a greater dynamic range of luminosity or brightness levels, creating greater contrast. This increased contrast reveals the subtle nuances of the image, from detailed blacks and shadows to the brightest whites and colors, plus greater depth. The DHC-60.7 offers support for HDR 10 only through its HDMI 1-5 inputs and both HDMI outputs (does not support Dolby Vision or HLG). 4:4:4 Color Subsampling: The AV Controller's HDMI inputs (1-5) and outputs support RGB, YCbCr 4:4:4, YCbCr 4:2:2, and YCbCr 4:2:0 color subsampling (@ 60Hz or 50Hz). With 4:4:4 color subsampling, luminance (brightness) and chroma (color) are sampled at the same rate; resulting in an RGB color palette as big as the video sampling rate for a video image with more colors, plus greater color accuracy and detail. Dual HDMI Outputs: The dual HDMI outputs can simultaneously output the same audio/video signal to two TVs, or you can assign the second HDMI output to Zone 2 to display a different HDMI source (1-5 inputs) in another room - video is output at the resolution supported by both TVs. Analog Video-to-HDMI Conversion: The AV Controller is equipped with three composite video inputs (480i only) and two component video inputs (480i only), as well as a composite and component video output. 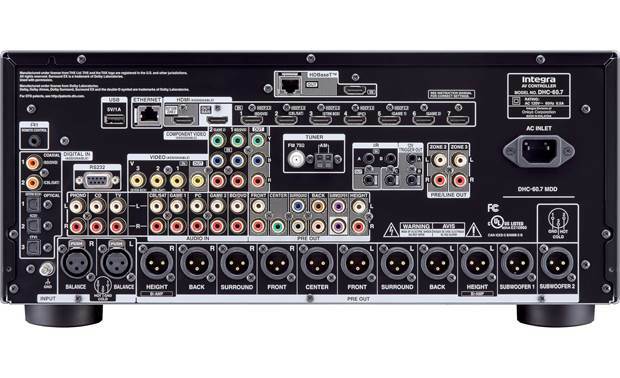 The composite video output only supports the unit's composite video inputs (not component or HDMI), while the component video output only supports the unit's component video inputs (not composite or HDMI). Analog composite and component video signals input to the AV Controller can also be converted to HDMI signals and then output from the unit via its main HDMI monitor output to your TV. The resolution remains the same and is not upscaled. Other HDMI Features: The DHC-60.7 AV Controller's HDMI connectivity also offers ARC (Audio Return Channel), 3D video pass-through, Deep Color & x.v. Color support, as well as an auto LipSync function. ARC (Audio Return Channel): The controller's main HDMI output features ARC (Audio Return Channel). This feature allows audio to be sent from your compatible HDTV to the AV Controller through the same HDMI cable already being used to send audio and video to your HDTV. This eliminates the need for extra cables connected to your television. The sub HDMI monitor output does not support this feature. Auto Lip-Sync: The Lip-Sync function can automatically synchronize HDMI audio and video (for any HDMI jack) that has gotten out of sync due to the complex digital video processing being performed by your HDMI-compatible TV. With HDMI Lip-Sync, the audio delay required to synchronize the audio and video is calculated and applied automatically by the AV Controller. You can also manually correct the audio delay from 0 (no delay) to 400 milliseconds; in 10 millisecond steps. HDMI Standby Through: When enabling the HDMI Standby Through function, regardless of whether the AV Controller is "Off" or in "Standby", both audio/video streams from an HDMI input will be output to your television, via the AV Controller's HDMI monitor output. You can select between three HDMI Through modes. Last: The HDMI Through function is activated on the input source selected at the time of setting the AV Controller to the "standby" mode. HDBaseT Compatible: HDBaseT is a newer standardized method to transmit 4K UltraHD and digital audio much farther than is recommended over HDMI alone. HDBaseT allows signals to be transmitted up to 328' utilizing cat5e/cat6 cable to any certified third party HDBaseT receiver or device that has its own power supply. This makes long distance runs to projectors or a second zone easy and reliable. The HDBaseT connection of the AV Controller consists of a HDMI input and Ethernet output. The HDMI input can be used to connect the AV Controller's Main HDMI output or Sub/Zone 2 HDMI output (but not both) using the included 15" HDMI cable. The Ethernet out lets you connect a cat5e/cat6 cable and run it to a compatible HDBaseT receiver (such as the Integra HDB-RX1; sold separately) before connecting it to your display. Note: The HDBaseT Ethernet output and HDMI input are located on the rear-panel behind a sticker labeled "HDBaseT Custom installer use only". Ethernet (LAN) Jack: The Integra AV Controller is equipped with an Ethernet (RJ-45) jack for connecting the player to your home network giving you access to DLNA content, Internet Radio, online music services, and AirPlay. Connecting the AV Controller's Ethernet port to a 100Base-TX switched Ethernet network is recommended for best results. Use a shielded CAT-5 Ethernet cable to connect the AV Controller to your home network. The DHC-60.7 does not offer wireless WiFi connectivity to connect to your home network. However, you will need a WiFi enabled router to stream Spotify and AirPlay over your home network from your smartphone or tablet device to the AV Controller through its Ethernet jack. Network setup requires that the AV Controller be connected to your TV via HDMI for display of the on-screen menu. The controller's network setup cannot be accessed through its front-panel display. Built-in Online Music Services: The Integra DHC-60.7 offers several built-in internet radio & online music services through its wired network connection. Slacker: Slacker Radio delivers free and subscription-based access to millions of songs and hundreds of music-centric stations, handcrafted by experts in every genre, as well as stations and content devoted to live music, news, celebrities, and lifestyle. Spotify Connect: The integration of Spotify Connect will enable Spotify Premium users to instantly select and wirelessly stream music to the Integra AV Controller from within the Spotify app (Apple iOS or Android). Spotify is a digital music service that gives you on-demand access to one of the largest music libraries in the world (over 15 million tracks and counting). Spotify makes it easier than ever to discover, manage, and share music with your friends. You can browse music by artist, album, track, or most popular; and create your own music library with customized playlists. 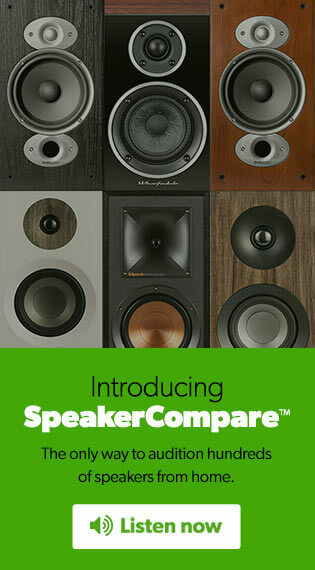 AirPlay Compatible: AirPlay lets you stream your favorite songs directly from your Apple iOS (4.3.3+) device or from your iTunes (10.2.2+) library on your Windows PC or Mac computer to the AV Controller, over your home's wireless network connection. From your Apple iOS device you are able to stream stored music on your device, downloaded music apps, and music on your iCloud to the AV Controller. From your Windows or Mac you can stream your stored iTunes music library on your computer to the AV Controller; you can even download Apple's free Remote App onto your compatible iOS device to browse and control playback functions of the music stored in your iTunes music library on your computer that is being streamed to the AV Controller. With AirPlay you also get to see song/artist information and album art via the AV Controller's on-screen menu (via HDMI). HDMI Zone 2: The Integra DHC-60.7 provides a Zone 2 HDMI output, so two different HDMI audio/video feeds can be sent to two different displays at the same time directly from the preamp (HDMI 1-5 connected input sources only). HDMI Zone 2 will output up to 4K video and 2-channel audio for the HDMI input source selected. Video will be output at the highest resolution supported by both TVs. If you have the same HDMI source playing back in the main room and Zone 2, then the main room is also limited to 2ch PCM audio. HDMI Zone 2 can also be setup through the AV Controller's HDBaseT connection (see Video Section for further details). Incompatible Sources: Tuner, Analog, USB, Network, and Optical/Coaxial Digital audio sources; plus analog video sources and HDMI 6-8 inputs. Zone 2 (Audio Only): In addition to the main listening room, you can also enjoy audio playback from a different source in another room of your home using the AV Controller's Zone 2 function. By using the Zone 2 line-level outputs on the DHC-60.7 you can connect an external receiver or integrated amplifier in a second room, allowing you to listen to 7.2ch or 7.2.2ch surround in the main room and play a different audio source in another room of your home. The volume of Zone 2 can be controlled from the DHC-60.7 or your add-on integrated amplifier/receiver. 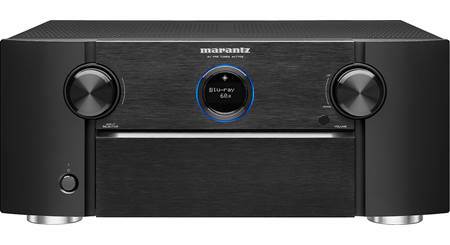 Compatible Sources: AM/FM tuner, HDMI Audio 1-5 (2ch PCM only), Analog & Optical/Coax Digital (2ch PCM only) inputs, USB, Network (including DLNA, AirPlay, Internet Radio, & Online Music Services) can be played back in Zone 2. Incompatible Sources: HDMI Audio (6-8), as well as all HDMI video and analog video inputs cannot be output to Zone 2. DSD audio files cannot be played back in Zone 2. As for Network and USB sources; you cannot select different inputs for the main room and Zone 2. For example, if a Network source has been selected in the main room and then USB is selected as a playback source in Zone 2, the input in the main room will also change to the USB source. Zone 3 (Audio Only): Zone 3's line-level outputs allow playback of a separate source in 2-channel stereo in a third room of your home using a separate integrated amplifier (keeping either 7.2ch or 7.2.2ch playback in your main room). The volume of Zone 3 can be controlled from the DHC-60.7 or your add-on integrated amplifier/receiver. Compatible Sources: AM/FM tuner, Analog inputs, USB Audio, Network (including DLNA, AirPlay, Internet Radio, & Online Music Services) can be played back in Zone 3. As for Network and USB sources; you cannot select different inputs for the main room and Zone 3. For example, if a Network source has been selected in the main room and then USB is selected as a playback source in Zone 3, the input in the main room will also change to the USB source. When listening to AM/FM or Interent radio, you cannot select different stations for the main room and Zone 3. Integra Control Pro App: The Integra Control Pro App (for Apple iOS 8.0+ & Android OS 4.0.3) features an intuitive, user-friendly interface that allows you to conveniently operate the Integra DHC-60.7 from your compatible Apple iOS or Android device. This app not only has the usual remote control functions, it also has a multiroom functionality for Zone 2 and Zone 3. Streaming Audio: Lets you play audio from built-in music streaming services (such as Pandora, Spotify) the music library on your Apple iOS or Android device, and your Windows PC or other DLNA-compatible server. You can also access music from a connected USB source device. Multiroom Audio: Provides control over Zone 2 and Zone 3 function. Note: The DHC-60.7 does not offer wireless WiFi connectivity to connect to your home network (only an Ethernet jack). However, you will need a WiFi enabled router to use the Integra Control Pro App to communicate with the AV Controller over your home network through the controller's Ethernet jack. IR Remote: The Integra DHC-60.7 comes with an IR remote control for wireless operation of the AV Controller. There is a 3.5mm RI remote control jack that allows you to connect the AV Controller to other compatible Integra components and control it from the included IR remote. HDMI Control: This function allows HDMI-CEC compatible components or RIHD-compatible components connected via HDMI to be controlled with one another's remote control commands. The AV Controller will enter Standby mode when the power of the TV is turned to Standby. You can set on the menu screen of the TV to either output the audio from the speakers connected to the AV Controller, or from the speakers of the TV. It is possible to output the audio/video from the antenna or from the input jack of the TV from the speakers connected to the AV Controller. Input to the AV Controller can be selected with the remote controller of the TV. Operations such as volume adjustment or similar for the AV Controller can be performed from the remote controller of the TV. RS-232 & IP Control: The DHC-60.7 includes system integration connectivity such as RS-232 and IP control with support for two-way communication with 3rd party home automation systems and a web based browser. 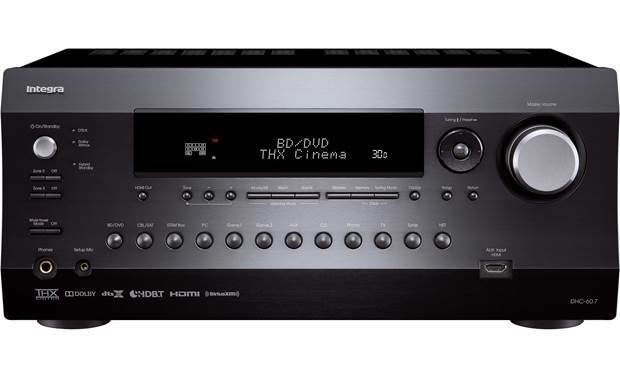 IR Inputs/Output: Two infrared (IR) inputs and one IR output make for a clean, reliable installation and allow pass-through of IR signals to control other devices connected to the DHC-60.7, such as a TV or Blu-ray player. Three 12V Triggers: Three fully programmable 12 volt triggers (3.5mm) can be used to raise/lower a projection screen, power on/off an external amplifier, and open/close the drapes all with the touch of a button. On-Screen Menu w/ Setup Assistance (HDMI only): The Integra DHC-60.7 offers an on-screen (GUI) menu system through its main HDMI output. The simple on-screen display combines text and graphics that make setup and other operations extremely easy. The initial setup assistant takes you step-by-step through speaker configuration, source connection, remote programming, and network connection. Note: Initial setup requires that the controller be connected to your TV via HDMI for display of the on-screen menu. Many of the controller's setup functions can only be found via the on-screen menu and not the front-panel display. Name Edit: You can enter a custom name for each individual input selector and radio preset for easy identification. When entered, the custom name will appear on the display. This function cannot be used for Network sources. Auto Standby & Sleep Timer: The AV Controller will automatically go into Standby mode, if there is no operation for 20 minutes with no audio signal input. The Sleep Timer can be set to automatically turn off the controller after 30, 60, or 90 minutes. Firmware Updates: Future firmware updates are available from Integra through the AV Controller's Network or USB connection. Visit Integra's online Download Center for the latest firmware updates. Get a pre/pro with 11.2-channel processing and Dolby Vision HDR capability. 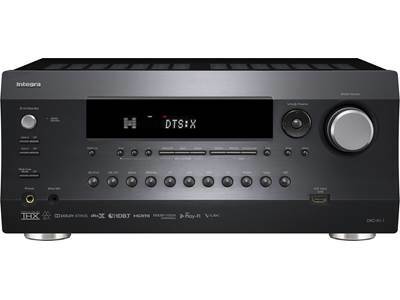 Searches related to the Integra DHC-60.7 Home theater preamp/processor with 7.2-channel processing, Apple® AirPlay®, Dolby Atmos® and DTS:X™.